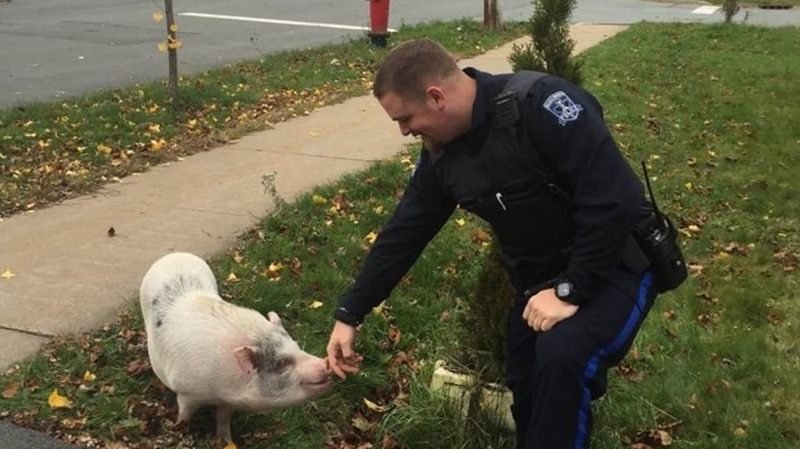 Police in Dartmouth, Nova Scotia, were called out Tuesday to round up a runaway pig. The potbellied pig, named Kevin Bacon, was found wandering on Russell Street. Officers Nick Webber and Cody Schultz said the pig was happy and friendly, and gave them no trouble at all. Woodworth chuckled and said, "I think he was just excited to be out front. You could say he was footloose and fancy free." She said Bacon was not in any danger and was following the rules of the road by staying on the sidewalk, adding that he hadn't ventured far from his home after likely escaping from his backyard. Kevin Bacon was safety returned to his owner. Sandra Blackman of Bristol, England, has celebrated her birthday on November 10 for more than 50 years. But she recently ordered a copy of her birth certificate and found that she was born on November 11. As if that weren't confusing enough, her old school records have her birthday listed as November 12. Birthday confusion appears to run in the family. Blackman's mother celebrated her birthday a week later than the actual date for 16 years. She blames it on the fact that her grandmother had a lot of children. Nevertheless, Blackman is throwing herself a birthday party on the 10th at the Brunel Pub, and has invited everyone through the local newspaper. An unnamed driver in New South Wales, Australia, was taking some castoff material to the dump when he was surprised by a huntsman spider. Huntsman spiders are venomous but not deadly to humans. However, they can grow very large. When the driver saw the spider, he was approaching a bend in the road on Kenwood Drive, hit the accelerator instead of the brake, and the car plunged over an embankment into Lake Cathie. The car sank, but the driver was able to escape through the car's open window. Emergency services took the driver to a hospital for minor injuries, and a project is underway to recover the four-year-old Toyota Prado. Nine students at Eagles Nest Elementary School in Dorchester County, South Carolina, faced expulsion for having "happy crack" in their possession at the school. Their parents did not know what "happy crack" is, but found out it's a combination of sugar and Kool-Aid powder. The ten-year-olds were buying what they considered Pixy Stix from each other. The students had an expulsion hearing on Tuesday for a level three infraction of school rules. "No student will market or distribute any substance which is represented to be or is substantial similar in color, shape, size or markings of a controlled substance in any of the circumstances listed above. Look-alike substance or substances that mimic the effect of drugs will be treated as illegal substances." Parents met with school officials on Tuesday, and the charges were reduced to level one infractions. The students returned to school on Thursday. A squirrel jumped up and began attacking people Thursday at Sterling Court, a Deltona, Florida, retirement community. One person was bitten and scratched outside, and then threw the squirrel off—and into the building. There, it attacked other residents. An employee called 911 to report that people were bleeding. The residents managed to throw the squirrel back outside, but three people were taken to a hospital for their injuries. They were all released and are doing well. Russian president Vladimir Putin issued an executive order to grant Russian citizenship to his longtime friend, actor Steven Seagal. Seagal has expressed a desire for citizenship in the Russian Federation for years. Seagal and Putin have a common interest in martial arts, and have appeared together at martial arts events. Achieving Russian citizenship does not mean that Seagal is giving up his American citizenship.